10TH CIRCUIT RULES THAT FEDERAL ADMINISTRATIVE LAW JUDGES ARE CONSTITUTIONAL OFFICERS AND REJECTS CLASSIFICATION OF FEDERAL ADMINISTRATIVE LAW JUDGES AS EMPLOYEES. by Administrative Law Judge and IAALJ Member Stanley J. Cygan (IL). At the 2005 NAALJ conference in Chicago, long-time NAALJ member Stan Cygan made an address to the membership on NAALJ history. Click Here for link to the History. The Illinois Administrative Code is the codification of the rules and regulations established by the executive departments and agencies of the Illinois government. It is divided into titles by subject. Access the Illinois Administrative Code Here. Welcome to the web site for the Illinois Association of Administrative Law Judges (IAALJ). The Illinois Association of Administrative Law Judges (“IAALJ”) is an Illinois not for profit corporation committed to the advancement of administrative justice and the professional status of administrative law judges dedicated to government service in Illinois. Membership in the IAALJ is open to all persons who are serving as administrative law judges, administrative judges, commissioners, hearing officers, and all other persons assigned to perform adjudicatory functions on the federal, state and local level in Illinois. 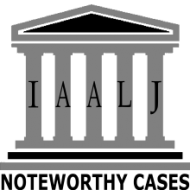 The IAALJ is the Illinois affiliate of the National Association of the Administrative Law Judiciary (“NAALJ”) and membership in IAALJ includes membership in NAALJ. Tuesday, December 4, 2018, from 5:30 to 7:30. PLEASE NOTE THAT IAALJ DUES FOR 2017-2018 ARE NOW DUE AND PAYABLE. - 10TH CIRCUIT RULES THAT FEDERAL ADMINISTRATIVE LAW JUDGES ARE CONSTITUTIONAL OFFICERS AND REJECTS CLASSIFICATION OF FEDERAL ADMINISTRATIVE LAW JUDGES AS EMPLOYEES. Click here for the OPINION. - 7th CIRCUIT REJECTS JUDGES' GRIEVANCE CLAIMS - SEE AALJ ET AL V. COLVIN, US COURT OF APPEALS, 7th CIRCUIT NO. 14-1953, DECIDED JANUARY 23, 2015. Click here for the OPINION. - APPELLATE COURT NIXES JUDGES' BID FOR UNION REPRESENTATION - SEE AFSME V. ILLINOIS LABOR RELATIONS BOARD, 2014 IL App 3955065 (August 13, 2014). Click here for the OPINION.